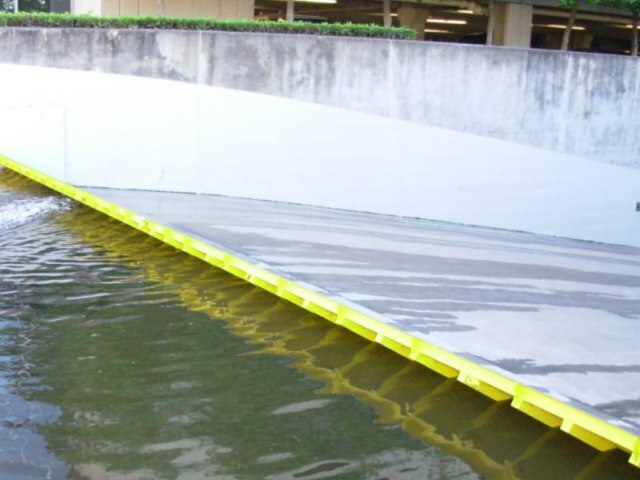 Why does the FloodBreak flood barrier float? Why does the flood barrier float? The FloodBreak passive flood barrier is actually a buoyant panel constructed of hollow aluminum extrusions. 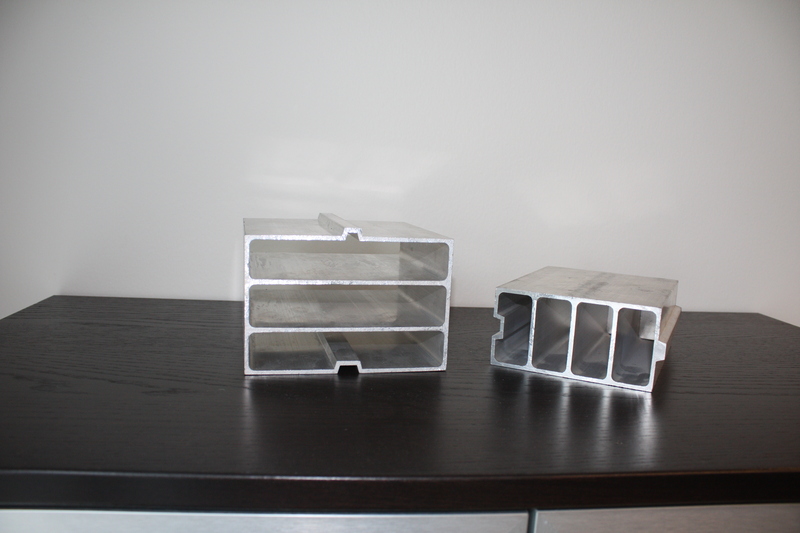 The extrusions are designed to be structural while also providing excellent flotation. Additionally, the extrusions are chambered so that even if an area of the panel is compromised, the overall panel will still float. This is similar to the design of a ship’s hull, where bulkheads protect the ship even if the hull is locally damaged. How much does the floating panel weigh? The actual weight varies depending on the type of gate, size and any special coatings or surface treatments specified. We design the cross-section of the gate panel to ensure that the total weight is always less than the water it floats upon and include a factor of safety to ensure this. Every floodgate is certified by an independent professional engineer who ensures that the floodgate is designed to successfully deploy. Will the FloodBreak Gate operate with muddy water? We have a problem with silt and clay in our floodwater. How does this affect the operation and maintenance of the floodgates? FloodBreak Automatic Floodgates will operate normally with silt and clay suspended in the floodwater. It doesn’t impact the operation – even very muddy water will float the gate. The system is designed so that debris is washed through to the pan and out the drainage pipes, including during rainstorms and other non-flood water events. The gate and pan are designed to be self-clearing both before and during a flood. Will debris affect the operation of the gate? The gate and pan are designed to be self-clearing both before and during a flood. Debris is blocked from entering the pan prior to a flood, and the gate and tension members are designed to withstand impact from large objects floating in the floodwater. Drains act to keep the pan clear during normal conditions and to remove the floodwater quickly once a flood has begun to subside. We always recommend checking and clearing the gate after a flood has receded. In over a decade of field deployments, debris has never caused damage or malfunction of our systems. Does the gate have to be in the 90 degree, fully upright position to stop the flood? The FloodBreak system will rise with the flood, from initial activation all the way to full deployment. The higher the flood, the higher the gate rises. The gate will hold the maximum elevation of flood water it is designed for. The majority of flood events are far less than the full design elevation, and therefore the gate works even during unexpected events at odd times. Can FloodBreak Automatic Floodgates be used to prevent floods from sea water? Do the materials corrode? Yes, FloodBreak gates can be installed in marine applications. All of the components used in the fabrication of our gates are specified so that rust or corrosion are not a factor even in harsh environments such as road salt and salt water. What is the material used in the seals on the gates? What is the rated life of the material? What is the maintenance and replacement process for the material? All of FloodBreak’s seals are made from EPDM (Ethylene Propylene Diene Monomer). The blended sheet is a black colored sheet rubber which provides excellent resistance to weathering, chemicals, salts, ozone and UV exposure. It is rated for 10 year service life and can be easily replaced when required. See material specifications. What are the maintenance requirements for your automatic floodgates? FloodBreak Automatic Floodgates are designed for long service life and require minimal maintenance.They are designed to be self-clearing but a power washer can also be used to clean away any debris. We recommend an annual inspection to check the gate panel, pan, and sidewalls for visible damage or misuse. With the gate in the raised position,the gasket, gasket flange bolts and hinges should also be checked. We suggest that spray lubricant beapplied to the gaskets. That’s it.